The strange looking numerals at the bottom of bank checks are printed in magnetic ink in a font called MICR E-13B. This typeface was developed in the mid 1950s and was used by banks in 1960s all the way to the present day. This system only supports numerals and a few control codes but that didn’t stop Leo Maggs. In the mid 1960s, he created Westminster—a typeface based on the look of MICR E-13B. Soon, dozens of magnetic typefaces appeared. The magnetic typeface became associated with cutting edge technology and fashion all the way through to the late 1970s. In the 1980s, home computers appeared. They used pixel fonts and dot matrix type—the old magnetic typefaces all-of-a-sudden looked hokey. These days, designers are using magnetic typefaces in a different context. The meaning has changed from ultramodern, to old-fashioned, yet still synthetic. But in the half century since the first magnetic typefaces appeared, we’ve mainly had to old fonts to work with—1990s digitizations of older analog type. That’s why there’s Minicomputer. 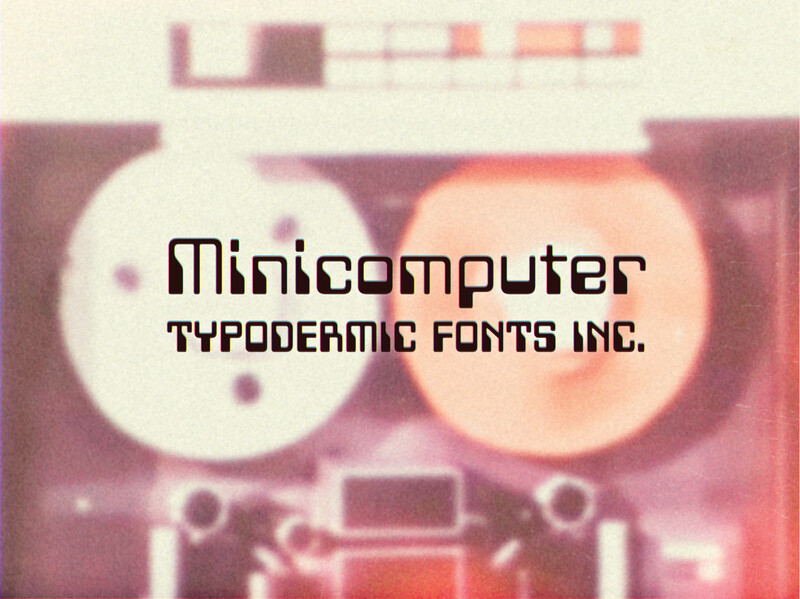 Minicomputer is a magnetic ink typeface with a versatile range of seven weights and italics. Language coverage includes most current Latin based languages, Vietnamese, Greek and Cyrillic. There are OpenType fractions and numeric ordinals as well as plenty of mathematical symbols. Minicomputer has an OpenType old-style numerals feature which brings up the original MICR E-13B numerals. You can even type some of the old control codes if you use fleuron characters.